Photo by Worthington & Shagen Custom Builder, Inc. Your bathroom’s shower is one of the smallest but most frequently used spaces in your home. If you’re planning a remodel, way not make this hardworking corner a luxurious retreat? Just imagine waking up each morning and starting your day in a shower that is custom-designed for your personal preferences. With a little planning you can make this part of your new bathroom one of your favorite spots in your home. 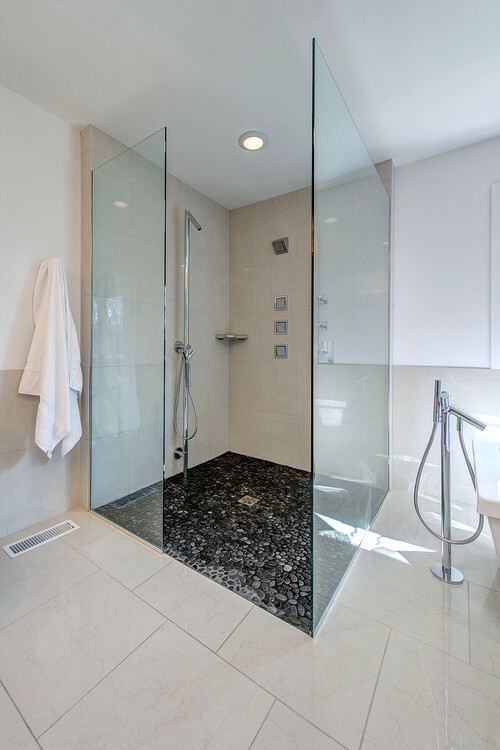 Photo by Master Home Remodelers Inc Zero threshold showers have become almost synonymous with luxury showers. They add an openness to this usually cramped space. As an added bonus, since these types of showers don’t have a lip or step to enter, they are easily accessible to just about anyone, including people in wheelchairs. With fewer corners this style of shower is also easier to keep clean than typical lipped shower stalls. Nothing helps you wake up in the morning quite like natural light, and a window in your shower makes a great addition to your bathroom. Not only is the additional light source good for you, but it also allows you to bring humidity loving plants into your bathroom. Speaking of bringing the outdoors in, incorporating nature-inspired materials like stone or wood is a great way to create a beautiful, luxurious shower. Elements like a river stone floor for your shower not only look spectacular but will also feel great on your feet. 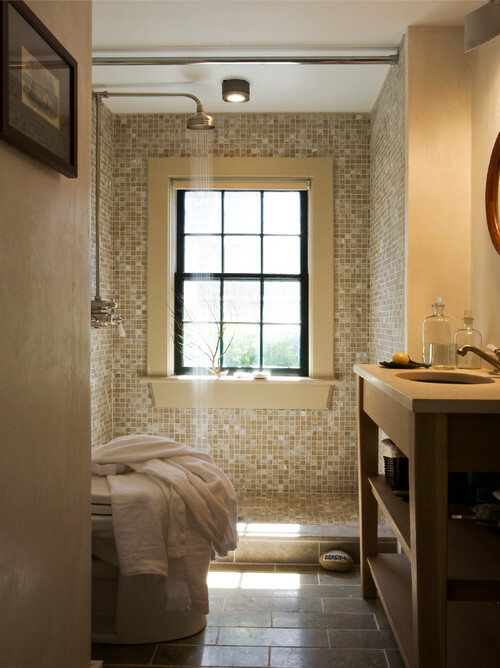 Adding a steam shower to your bathroom will bring all the makings of a spa to your home. With the touch of a button you can be enveloped in a warm cloud of water that will sooth tired or sore muscles, leaving you feeling refreshed and relaxed. And don’t forget to include a bench seat in your steam shower, so you can sit back and stay awhile! If a steam shower isn’t in your budget or on your wishlist, you might consider having a rainfall shower head installed. These overhead shower heads make it easy to rinse off without crouching under a standard height shower head. Often they come paired with a second detachable shower head, giving you the best of both worlds. Whatever components make up your ideal shower Stohlman & Kilner are here to turn your dream bathroom shower into a reality. Give our office a call today, and find out how we can help create a luxurious retreat inside of your D.C. area home.